A woman stabbed her boyfriend to death with a kitchen knife because she believed he was cheating on her with another woman, a court has heard. 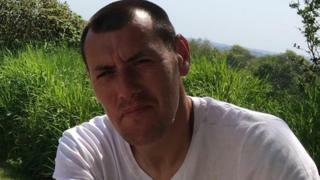 Lindsey Gabriel, 31, denies murdering James Field, 35, in the attack at her home in Bugle, near St Austell, Cornwall. Mr Field stumbled out of the doorway onto the pavement where he bled to death on 28 September last year. Truro Crown Court heard the defence will claim Mr Field stabbed himself. The jury was told Ms Gabriel made a 999 call during the argument in which she can be heard repeatedly shouting "get out of my house" and then telling the call handler "he's stabbed himself". Prosecuting, Jo Martin QC, said the pair had a "tempestuous relationship" and Ms Gabriel believed he was having affairs. "He denied it and believed she was paranoid," she added. Jurors heard that on 28 September she had sent a string of abusive text messages to Mr Field that included telling him: "You don't know what I am capable of. "Remember James you have met your match. And your match will match you. I am an animal. Bring it on, big boy." She also disconnected one of his two mobile phones and contacted his boss on a building site to tell him Mr Field was using drugs, the court heard. She smashed up his car parked on her driveway, before covering it in wrapping paper and having it removed by a scrappage firm, jurors were told. When Mr Field finished work at a building site in Newquay he went to St Austell where he drank some beer and smoked a small amount of heroin, the court heard. He then went to Bugle and walked to Ms Gabriel's house, noting his car was not on the driveway when he arrived shortly before 20:00 BST. He was stabbed shortly afterwards.